Dog health problems can be exasperating for their owners because your dog can’t tell you what’s wrong or where it hurts. If you notice that your dog has vomiting, diarrhea or the dog not eating it may be suffering from digest upsets just as people do occasionally. 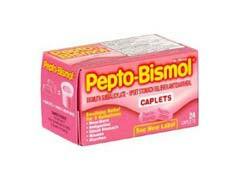 Pepto Bismol for dogs can provide temporary relief. Every 4 to 6 hours, you can give the dog 1 teaspoon or ¼ tablet of Pepto Bismol for each 20 pounds of weight. If you are going to use Pepto Bismol for dogs be sure to give your veterinarian a call first. If the symptoms return when you stop using Pepto Bismol for dogs it is time to take the dog in for an examination to diagnoses underlying problems. Possible Pepto Bismol side effects include darkening or change of color of bowel movements, urine tests being inaccurate, the tongue darkening, and interfering with X-rays of the abdomen. Pepto Bismol for dogs should not be given for long periods of time. Some dogs may not respond at all to Pepto Bismol. Injury, illness and age can cause your dog pain. Pain relief for dogs is available through many of the same medications that humans take. Non-steroidal anti-inflammatory drugs like aspirin, ibuprofen and naproxen may be helpful. Arthritis or hip dysplasia can cause chronic pain. Cox-2 inhibitors or narcotics may be needed. Consult your veterinarian before giving any of these medications to your dog! Dog vitamins may help prevent some dog health issues. Additives in commercial dog foods can result in a buildup of damaging free radicals. Antioxidants help to counter this problem. Omega fatty acids help support heart health. Glucosamine chondroitin keeps cartilage healthy and eases the pain of arthritic joints. Ask your veterinarian about which vitamins are best for your pet.